So, what's up with the recent sea salt craze? I love the blue corn tortilla chips (yes, I'd marry them, but I'm already married to the greatest female God ever graced the earth with, and I'm not really into that whole polygamy thing) - they are lighter and not as overly salty as the regular chips. Anyway, you'll notice they are made with sea salt. And the other day I noticed at Sam's Club that all the Planters nuts (I got one tin of cashews and one of dry roasted peanuts - they didn't have a mere peanut/cashew mix, so I figured I'd get handfuls from each tin and mix them myself) were made using sea salt. And I've seen sea Salt scrubs and stuff at those center-of-the-mall selling stands. So, what's up with all the sea salt fascination these days? After all the global warming and save the old growth tree huggers and PETA and green this and save the world that, don't we realize what we're doing with this sea salt craze? We're going to completely desalinate the ocean! Maybe not today or tomorrow, and eventually the salt will go into people and then into the ground when the people die and eventually back into the ocean from erosion of the ground where the bodies decayed, but that will take generations, and the earth's ecosystem may not survive long enough to support 100% fresh water oceans. Yes, it will be beneficial for shipwrecked sailors, but what about the salt water marine life? I mean, sure, no more shark attacks, and maybe no more jellies in the gulf, but we'll lose a lot of beneficial things, like tuna. I like tuna (it really upset me when O'Charley's quit selling their grilled tuna meal!). I like it a lot. Grilled, flaked, salad, you name it. And when all the varieties of salt water marine life are gone, coastal fishermen will be out of work (until the fresh water species realize their world just got a lot bigger). And if the sea algae and plankton can't survive in the fresh water environment, well, there's a huge CO2 sink gone... And that might REALLY lead to some human-induced global warming. We could unintentionally lead to the collapse of the global ecosystem and the elimination of all life on earth, just because we want to put a little sea salt on all our stuff (food, bodies, etc.) instead of regular old salt. Please, for the sake of all life on earth, start boycotting products that make use of sea salt now! 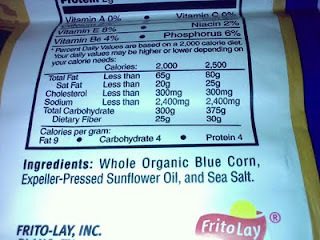 This public service message has been brought to you by Tostitos Blue Corn chips, featuring sea salt.